[SatNews] NASA has successfully completed a comprehensive pre-shipment review of the Fast, Affordable, Science and Technology Satellite, or FASTSAT, a small, microsatellite class spacecraft bus that will carry six experiment payloads to low-Earth orbit. The pre-shipment review was completed in May, demonstrating the flight hardware has successfully passed all environmental and performance tests and is authorized for shipment to the launch site for final integration on the Minotaur IV launch vehicle, built and operated by Orbital Sciences Corp. of Dulles, Va. Engineers will pack the satellite into a shipping container for delivery in early July to the launch complex in Kodiak, Alaska. FASTSAT is scheduled to launch no earlier than Sept. 1, 2010. Mission operations for FASTSAT and all six experiments will be managed from the newly configured small satellite control room at the Huntsville Operations and Science Control Center at the Marshall Space Flight Center. FASTSAT will be flying on the STP-S26 mission — a joint activity between NASA and the U.S. Department of Defense Space Test Program, or DoD STP. FASTSAT and all of its six experiments flying on the STP-S26 multi-spacecraft/payload mission have been approved by the Department of Defense Space and Experiments Review Board. 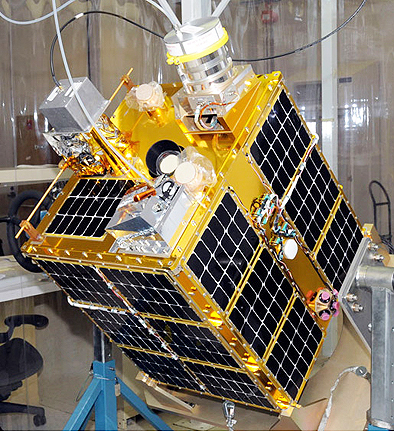 One of the six experiments on the FASTSAT bus, NanoSail-D, is designed to demonstrate deployment of a compact solar sail boom system that could lead to further development of this alternate propulsion technology and FASTSAT's ability to eject a nanosatellite from a microsatellite — while avoiding re-contact with the FASTSAT satellite bus. NanoSail-D, managed by the Marshall Center, will be the first NASA solar sail deployed in low-Earth orbit. It was designed and built by NASA engineers at Marshall in collaboration with the Nanosatellite Missions Office at NASA's Ames Research Center in Moffett Field, Calif. This experiment is a combined effort between the U.S. Army Space and Missile Defense Command and the Von Braun Center for Science & Innovation, both located in Huntsville, and NASA. The other two technology experiments include the Threat Detection System and the Miniature Star Tracker, both managed by the Air Force Research Laboratory at Kirtland Air Force Base, N.M. In addition, the spacecraft carries three atmospheric instruments built at NASA's Goddard Space Flight Center in Greenbelt, Md., in partnership with the U.S. Naval Academy in Annapolis, Md. 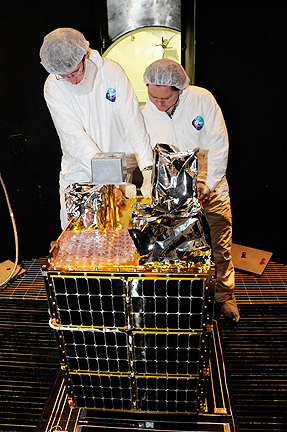 The instruments include the Thermosphere Temperature Imager (TTI), designed to measure the temperature, atomic oxygen and molecular nitrogen densities of the thermosphere; the Miniature Imager for Neutral Ionospheric Atoms and Magnetospheric Electrons (MINI-ME), a low-energy neutral atom imager that will detect neutral atoms formed in the plasma population of the Earth's outer atmosphere to improve global space weather prediction; and the Plasma and Impedence Spectrum Analyzer (PISA), a device that will test a new measurement technique for the temperature and density of thermal electrons in the ionosphere — which can interfere with radio-based communications and navigation. The satellite was designed, developed and tested at the Marshall Center in partnership with the Von Braun Center for Science & Innovation and Dynetics Inc. of Huntsville. 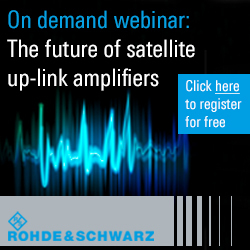 Dynetics provided key engineering, manufacturing and ground operations support for the new microsatellite. Thirteen local firms, as well as the University of Alabama in Huntsville, were also part of the project team.